Branched-chain amino acids (BCAAs) are one of the most popular supplements on the market due to their versatility in the sports world. They are a legal for any college or professional athlete, they’re affordable, and they can bring numerous benefits to every athlete regardless of body type. Whether you need strength, endurance, stamina, or faster recovery, BCAAs can help. Here are the top 5 reason why every high performance athlete should be taking BCAAs. In order to excel in any sport, some combination of explosive power, muscular endurance, and maximal strength is required. The best way to enhance these areas is to increase the amount of lean muscle tissue. Of the nine essential amino acids, leucine, isoleucine, and valine account for 35% of the essential amino acids found in muscle proteins. 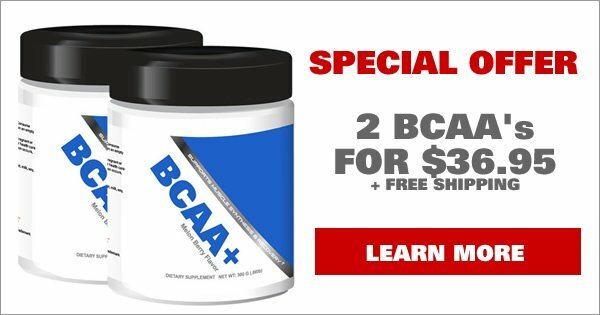 These BCAAs have anabolic effects on protein metabolism by increasing the rate of protein synthesis. Supplementing with BCAAs provides the body with an additional source of amino acids and has a muscle tissue sparing effect by preventing the breakdown of lean muscle tissue, which means your muscle is protected even during times of caloric or energy restriction. Endurance exercise increases energy expenditure and promotes protein and amino acid catabolism. BCAAs can be oxidized in skeletal muscles, and their oxidation is enhanced by exercise. Since BCAAs can be used as fuel to replenish ATP (Adenosine Tri-Phosphate) levels, they can enhance endurance and decrease fatigue. They can also delay fatigue and reduced levels of perceived exertion by inhibiting Tryptophan receptors in the brain. Perhaps the most immediate and profound benefit recognized by individuals who supplement with BCAAs is reduced muscle soreness. Athletes have reported that post-workout soreness nearly vanishes when taking BCAAs before, during, or after exercise. This allows you to come back even stronger the day following an intense training session. Reduced muscle soreness and allows you to train more frequently helping you to reach your full athletic potential more efficiently and effectively. Athletes need energy to perform at the top of their game. In addition to the numerous other benefits, BCAAs also act as a source of energy if taken prior to workouts or during intense physical activity. Since BCAAs bypass the normal digestion process and quickly enter into the bloodstream, they can be used as an immediate energy source to help fight off fatigue during your workouts, ensuring you get the most out of your training. Since BCAAs increase energy and reduce fatigue, they allow you to train harder and longer. Increasing your training volume will prepare you to perform at your best. BCAAs not only allow you to train harder and longer, but the enhanced recovery allows for reduced time between sets. And reducing time between sets means you get more done is less time. Performing at an elite level requires intense training, and supplementing with BCAAs will help you to get the most out of your training sessions.